Ranger Up gives Blackfive Readers 25% off until December 15th! This post is the MUST READ of the day. It's worth your time. "I will leave you with a story about the kind of people they are about the quality of the steel in their backs, about the kind of dedication they bring to our country while they serve in uniform and forever after as veterans. Two years ago when I was the Commander of all U.S. and Iraqi forces, in fact, the 22nd of April 2008, two Marine infantry battalions, 1/9 "The Walking Dead," and 2/8 were switching out in Ramadi. One battalion in the closing days of their deployment going home very soon, the other just starting its seven-month combat tour. Two Marines, Corporal Jonathan Yale and Lance Corporal Jordan Haerter, 22 and 20 years old respectively, one from each battalion, were assuming the watch together at the entrance gate of an outpost that contained a makeshift barracks housing 50 Marines. The same broken down ramshackle building was also home to 100 Iraqi police, also my men and our allies in the fight against the terrorists in Ramadi, a city until recently the most dangerous city on earth and owned by Al Qaeda. Yale was a dirt poor mixed-race kid from Virginia with a wife and daughter, and a mother and sister who lived with him and he supported as well. He did this on a yearly salary of less than $23,000. Haerter, on the other hand, was a middle class white kid from Long Island. They were from two completely different worlds. Had they not joined the Marines they would never have met each other, or understood that multiple America's exist simultaneously depending on one's race, education level, economic status, and where you might have been born. But they were Marines, combat Marines, forged in the same crucible of Marine training, and because of this bond they were brothers as close, or closer, than if they were born of the same woman. "Yes Sergeant," with just enough attitude that made the point without saying the words, "No kidding sweetheart, we know what we're doing." They then relieved two other Marines on watch and took up their post at the entry control point of Joint Security Station Nasser, in the Sophia section of Ramadi, Al Anbar, Iraq. A few minutes later a large blue truck turned down the alley way-perhaps 60-70 yards in length-and sped its way through the serpentine f concrete jersey walls. The truck stopped just short of where the two were posted and detonated, killing them both catastrophically. Twenty-four brick masonry houses were damaged or destroyed. A mosque 100 yards away collapsed. The truck's engine came to rest two hundred yards away knocking most of a house down before it stopped. Our explosive experts reckoned the blast was made of 2,000 pounds of explosives. Two died, and because these two young infantrymen didn't have it in their DNA to run from danger, they saved 150 of their Iraqi and American brothers-in-arms. When I read the situation report about the incident a few hours after it happened I called the regimental commander for details as something about this struck me as different. Marines dying or being seriously wounded is commonplace in combat. We expect Marines regardless of rank or MOS to stand their ground and do their duty, and even die in the process, if that is what the mission takes. But this just seemed different. The regimental commander had just returned from the site and he agreed, but reported that there were no American witnesses to the event-just Iraqi police. I figured if there was any chance of finding out what actually happened and then to decorate the two Marines to acknowledge their bravery, I'd have to do it as a combat award that requires two eye-witnesses and we figured the bureaucrats back in Washington would never buy Iraqi statements. If it had any chance at all, it had to come under the signature of a general officer. I traveled to Ramadi the next day and spoke individually to a half-dozen Iraqi police all of whom told the same story. The blue truck turned down into the alley and immediately sped up as it made its way through the serpentine. They all said, "We knew immediately what was going on as soon as the two Marines began firing." The Iraqi police then related that some of them also fired, and then to a man, ran for safety just prior to the explosion. All survived. Many were injured.some seriously. One of the Iraqis elaborated and with tears welling up said, "They'd run like any normal man would to save his life." "What he didn't know until then," he said, "and what he learned that very instant, was that Marines are not normal." Choking past the emotion he said, "Sir, in the name of God no sane man would have stood there and done what they did." "No sane man." What we didn't know at the time, and only learned a couple of days later after I wrote a summary and submitted both Yale and Haerter for posthumous Navy Crosses, was that one of our security cameras, damaged initially in the blast, recorded some of the suicide attack. It happened exactly as the Iraqis had described it. It took exactly six seconds from when the truck entered the alley until it detonated. You can watch the last six seconds of their young lives. Putting myself in their heads I supposed it took about a second for the two Marines to separately come to the same conclusion about what was going on once the truck came into their view at the far end of the alley. Exactly no time to talk it over, or call the sergeant to ask what they should do. Only enough time to take half an instant and think about what the sergeant told them to do only a few minutes before: ".let no unauthorized personnel or vehicles pass." The two Marines had about five seconds left to live. It took maybe another two seconds for them to present their weapons, take aim, and open up. By this time the truck was half-way through the barriers and gaining speed the whole time. Here, the recording shows a number of Iraqi police, some of whom had fired their AKs, now scattering like the normal and rational men they were-some running right past the Marines. They had three seconds left to live. For about two seconds more, the recording shows the Marines' weapons firing non-stop.the truck's windshield exploding into shards of glass as their rounds take it apart and tore in to the body of the SOB who is trying to get past them to kill their brothers-American and Iraqi-bedded down in the barracks totally unaware of the fact that their lives at that moment depended entirely on two Marines standing their ground. If they had been aware, they would have known they were safe, because two Marines stood between them and a crazed suicide bomber. The recording shows the truck careening to a stop immediately in front of the two Marines. In all of the instantaneous violence Yale and Haerter never hesitated. By all reports and by the recording, they never stepped back. They never even started to step aside. They never even shifted their weight. With their feet spread shoulder width apart, they leaned into the danger, firing as fast as they could work their weapons. They had only one second left to live. Six seconds. Not enough time to think about their families, their country, their flag, or about their lives or their deaths, but more than enough time for two very brave young men to do their duty, into eternity. That is the kind of people who are on watch all over the world tonight-for you. 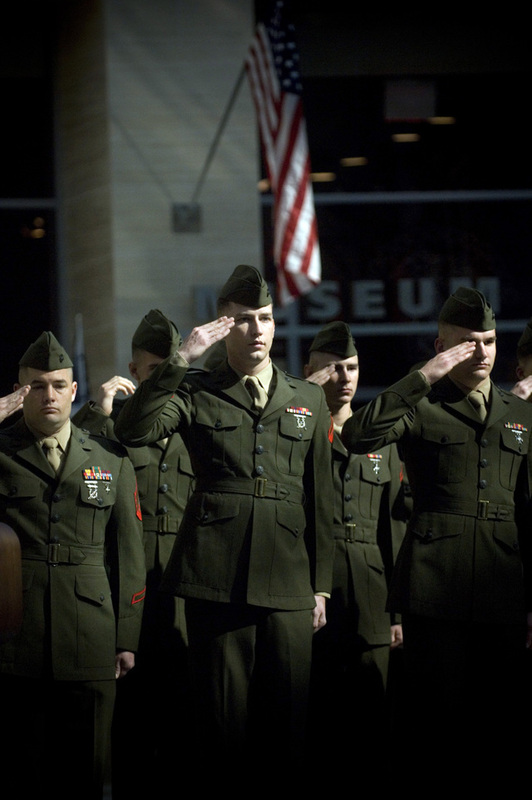 We Marines believe that God gave America the greatest gift he could bestow to man while he lived on this earth-freedom. We also believe he gave us another gift nearly as precious-our soldiers, sailors, airmen, Coast Guardsmen, and Marines-to safeguard that gift and guarantee no force on this earth can ever steal it away. It has been my distinct honor to have been with you here today. Rest assured our America, this experiment in democracy started over two centuries ago, will forever remain the "land of the free and home of the brave" so long as we never run out of tough young Americans who are willing to look beyond their own self-interest and comfortable lives, and go into the darkest and most dangerous places on earth to hunt down, and kill, those who would do us harm. Two Marines saved at least 50 that day. They gave their lives to defend their post stopping a truck with thousands of pounds of explosives from getting near the gate. Marines render honors while the national anthem is played during a Navy Cross ceremony in honor of two fallen Camp Lejeune Marines, Lance Cpl. Jordan Haerter, from Sag Harbor, N.Y., and Cpl. Jonathan Yale, from Burkeville, Va. Secretary of the Navy, the Honorable Dr. Donald C. Winter, presented the awards at a ceremony at the National Museum of the Marine Corps. Haerter and Yale posthumously received the Navy Cross for actions in April 2008. They are credited with saving the lives of many Marines and Iraqi police.